The importance of midfielders on a football pitch has been widely acknowledged and adequately documented over the years. It is almost a given that for a team to reign supreme over the course of one complete season, the midfield must excel and maintain the standards of excellence for the large part of the season. A drop in form, unwanted injuries and incorrect tactical decisions that destabilize a teamai??i? ?s midfield, may effectively dampen the teamai??i? 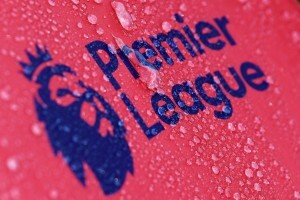 ?s core strength and compromise the title ambitions. Higher the tactical complexity in the nature of football, greater the importance of midfield for a team to succeed at the highest level and hence the consistency in delivery from midfield is ever so important in Italy where the tactical intricacies are of highest degree. Reigning champions in the peninsula, AC Milan are currently third on League standings separated from the leaders Udinese merely by a single point deficit which is expected to be overturned in due course of time. The current position on the league table is hardly worrisome for the Milan faithful as the team has more than covered the ground in the domestic scene after the unconvincing start that saw them crumbling amidst a series of unkind fixtures right at the beginning of the season. The important factors worth pondering over for Allegri at this point in time have got more to do with finding the correct combination in all departments and at the same time maintaining the desired standards on bench to apply the rotational policies. Ever since assuming his duties in the Milan office last summer, Allegri has not been known for being stringent about the first choice team that starts all the games. He has rather remained responsive and reactive to the situations and has accordingly made switches and rotations to ensure the squad remains in a healthy state at all the times. However, as the season enters the most decisive phase where alongside the domestic mission, the European reputation also is to be restored, it is vital for Milan to identify the best possible combination in the midfield area and the chosen players must start as many games as possible to maintain a harmonious symphony to see the team through the remainder of the season. Mark van Bommel - Is The Engine Finally Running Out Of Steam? The following players have started one or more games for Milan this season from different midfield positions. The numbers in the bracket indicate the number of games these players started during the season so far out of possible fifteen. The new acquisitions Antonio Nocerino and Alberto Aquilani have made their presence the most felt one while the old legs of Mark van Bommel and Clarence Seedorf too have enjoyed considerable playing time. *Seedorf started eight games however; only six have been taken into account here since he was fielded in the trequartista role in two of the games which does not fall under the scope of midfield roles being discussed here. The numbers very much suggest van Bommel, Aquilani and Nocerino have cemented their positions in the modernized looking midfield setup of Allegri. The threefold reasonably reduces the average age of the midfield when compared to that of some previous seasons which is a sign of change in the right direction. 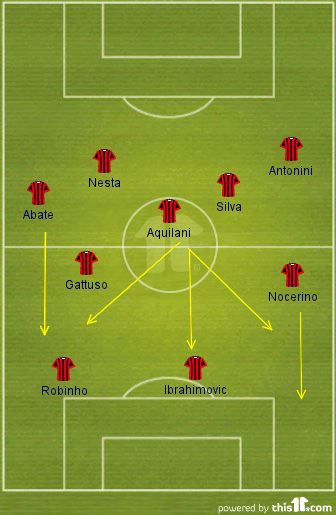 There are three clearly identified slots in the Milan midfield and it is safe to assume the mangerai??i? ?s approach shall not take a turn drastic enough for this very shape to change. Few observations from the style of play demonstrated by the midfield trio in the season so far quite clearly indicate what Allegri exactly expects from each of the three positions. Defensive Midfielder (DM) is hardly expected to assist the attackers and hence the player is seldom observed advancing in the final third. He pretty much remains right at the top of the defensive line focusing solely on dispossessing the oppositionsai??i?? Attacking Midfielder and other advanced players and reduces his game to that of a play-breaker. Right Midfielder (RM) comparatively operates from further up the pitch and since Milan possess a Right Back who relishes at overlapping the midfielder from the wing, the RM usually is the target man from the flank who receives the crucial lateral balls from the other end of pitch. He further doubles up as holding midfielder when the Red shirts are outnumbered inside their own half. Out of the three midfielders, the one filling this slot is expected to do the maximum running covering the entire length of the pitch. Left Centre Midfielder (LCM) operates much more centrally but maintains an average position that is only slightly ahead of the DM. The player fielding in this position is expected to read the game and outwit his counterparts on most of the times. 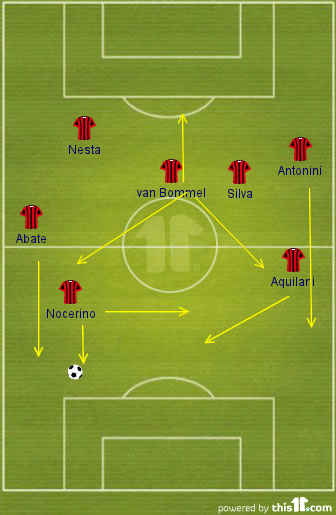 Since Milan do not possess a Left Back with lightning pace to run through the flank, the LCM usually aims at linking with the trequartista, narrowing the attack down in the final third. Despite being deeper than the RM, the LCM is seldom expected to track back into his own half but must engage into the dirty work of ball-winning. He often leads the counter attacks too, initiated deep in the opposition half. Apart from the two astute summer signings, Milan havenai??i? ?t invested much on the midfield and hence the number of alternatives is limited for Allegri to tinker much with the shape and design. There is little room for experiment in this area and the physical fitness and toughness for the first choice midfielders is quite essential to the Rossoneriai??i? ?s progress in the season. Below is the comparative, analytical study of various midfield combinations available to Allegri in the order they are mentioned. Undoubtedly, the three fit the best in the current setup and tend to exhibit an inch-perfect game according to the individual requirements of each of the slots they are filling in to. Collectively too, they seem to have gelled together pretty well and display a telepathic understanding between them in all aspects of the game. Nocerino boasts of both the defensive as well as attacking attributes required to operate from the right while his lack of creativity is more than complemented by Aquilani who starts from the left but maintains an average position from a much more central position. Van Bommel is one of the best defensive midfielders of the modern game, if not the best. The Dutch skipper disrupts the opposition right at the onset of their invasion in the Milanese half and more often than not finds either of his two midfield allies who further take the attack into the opponentsai??i?? half. The three first choice midfielders being continuously played for 90 minutes week-in, week-out is definitely going to aggravate their already fragile physical conditions and hence it is always desirable for the second string of players being able to execute the trade in a near similar fashion, however that is not exactly the case with Allegriai??i? ?s men in this department. Nocerinoai??i? ?s absence compels Aquilani to switch sides since there is no other midfielder among the reserves who can combine with Abate from the flank and let the Full Back overlap providing him the necessary cover. This effectively means the rest two slots will be filled by players who are well past their prime and have little to offer on either defensive or attacking front. Ambrosini particularly is heading towards becoming a liability on the field as despite assuming the arm-band; his performances have been far from inspirational. His shooting has been causing chagrin for some time now and to make matters worse, his ball control and passing range too have gone for a toss. Seedorf, well off his best days, is no longer holding the ball with ease when choked for space and his vision for a killer pass has also diminished considerably. However, a random exhibition of his effulgent trickeries makes him an effective utility player who can impact the nature of proceedings with his fierce striking powers. In a more advanced position, Seedorf is still the best among the midfielders warming the bench. Though chances of Rino Gattuso making a return to the field are extremely bleak, he can nevertheless make up for the third choice Right Midfielder as and when required. Gattusoai??i? ?s introduction on the field ensures he will undertake all the dirty work of ball winning which reduces the need of another dyed-in-the-wool defensive midfielder. Aquilani can in this case, operate from the Pirlo-esque role from the deep and he can bring much more on the table playing as the chief playmaker. Nocerino has already fielded on the left flank and this role demands much more from him in the build-up process than the one on right. Though Gattuso has slowed down on speed, he boasts of a highly formidable understanding with Abate and can very well cover up for the young Italianai??i? ?s defensive lapses while making advanced runs in the opposition half. Should Gattuso reclaim playing conditions sooner than most predict, this combination is the most suitable back-up in case of any injuries to or unavailability of any of the first choice midfielders. 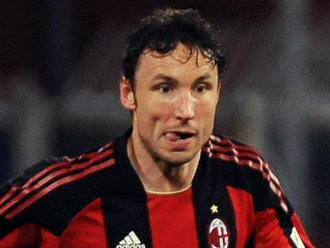 Mark van Bommel, no matter how crucial to Milanai??i? ?s success during last one year, is nearing the culmination point of his contract and uncertainties over his future in the Red & Black colours are looming large. Currently the Dutch beast has made the defensive midfielderai??i? ?s role his own and has done exceedingly well ever since moving from Bayern Munich during the last winter mercato. However, it is very likely that van Bommel will not be donning the Milan shirt at the beginning of the next season and hence it is very important that the replacement starts grooming well before time to ensure a smooth transition. The only other player who can replicate van Bommelai??i? ?s physical supremacy in the middle is Kevin Prince-Boateng. Though technically a different player, his work rate is as good as any other world-class midfielder and does possess the holding and passing abilities to operate from a deeper position. Boateng can start from left and protect Aquilani who can solely emphasis on providing the attackers with the deadly through-passes that they may capitalise upon. 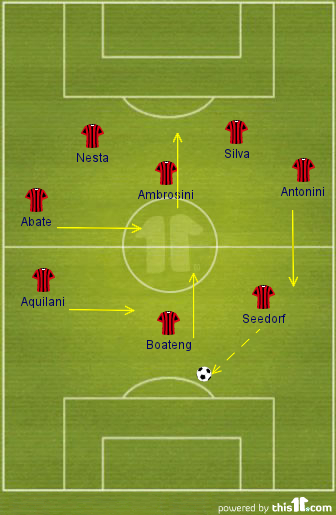 Boateng currently fields into the trequartista role but Milan have attacking options aplenty and even from a slightly deeper position, the Ghanaian is a strong enough player to add substance to the attack. Though formidable on paper, the Rossoneri midfield is extremely thin and any prolonged injury to the three chosen players may introduce undesired adversities for the manager. A dimension in the attacking midfield is required to be added and the focus during the winter transfer window must remain on adding proven players to the squad for the role. The solidity of the Milan defence and the attacking prowess are well-known; however the linkage between these two units requires a good amount of re-work for this crop of players to truly realize the potential they present on paper.